The study also revealed an unexpected correlation between the frequency of lightning flashes and the total volume of ash released. The amount of ash a volcano will spew out is hard to predict during an eruption, but not so for electrical discharges. “This is a parameter that can be measured—from a distance of several kilometers away and under conditions of poor visibility,” lead study author Corrado Cimarelli said in a statement. 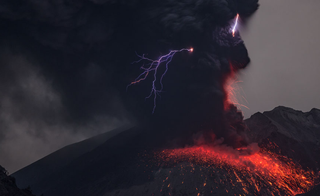 This means that, eventually, scientists could start using volcanic lightning to predict the size of an ash cloud and issue early warnings about air quality following eruptions. Even if you don’t live in a volcanically active area, there’s cause to be excited about this: it means plenty more stunning photos of volcanic lightning to come.